It may not necessarily occur to the entrepreneur of a one-person start-up company to document the processes and procedures that are followed in the day-to-day running of the business, but as the business grows, there comes a time when it will be vital to have records of how things are done. “Documenting business processes”, or “business systemisation” as it’s also known, will make the difference between a business that plods along with a business owner constantly on the verge of burnout, and one that is successful and grows and prospers, and where the business owner is secure in the knowledge that things will go smoothly whether he or she is on site or not. Here are some of the main reasons why you as an entrepreneur need to document your business processes. Anything that is done repeatedly, or by more than one person in your company, should be documented. You may have started out by “having everything in your head”, but when you begin delegating to employees, you need to ensure that they will be able to replicate your processes in order to provide the same level of service to your customers. While documenting your business processes, you will define the norms and standards of your services and products, and be able to analyse the performance of existing processes. If individual employees follow different processes, you will be able to make comparisons and opt for best practice. The Pareto Principle, also known as the 80/20 principle, also comes into play when analysing your business processes: the idea that 80% of your returns are the result of 20% of your efforts. Analysing where you are spending unproductive time or effort will help you to eliminate inefficiencies in your business. Again, once you have documented the norms and standards that your clients can expect, you can monitor whether your business is in fact, meeting those expectations. For example, if you have an IT company, and your response time is 24 hours, you can monitor precisely whether there are individual employees or branches that are not meeting this criterion, and take swift remedial action. Documenting your business processes will help you as an entrepreneur to understand your business in terms of its underlying individual processes. You will be able to evaluate the transformation of inputs into outputs, assess financial performance in terms of the value chain, and streamline your business strategy. One aspect of scrutinizing and documenting business processes is deconstructing them into sub-processes and mapping them down to activity level while another aspect of business process design is looking at the large-scale core processes from a strategic point of view. Both perspectives allow for redesign and re-engineering of processes that will lead to improvements and greater efficiency in your business. Business process mapping will enable you to identify gaps, for example where there is a need for appropriate checks and controls, or where there is a lack of co-ordination between different departments, e.g. between shipping and invoicing. You may be able to reduce wasteful activities or eliminate unnecessary steps in the production process, or simplify complicated procedures without loss of value to the customer. 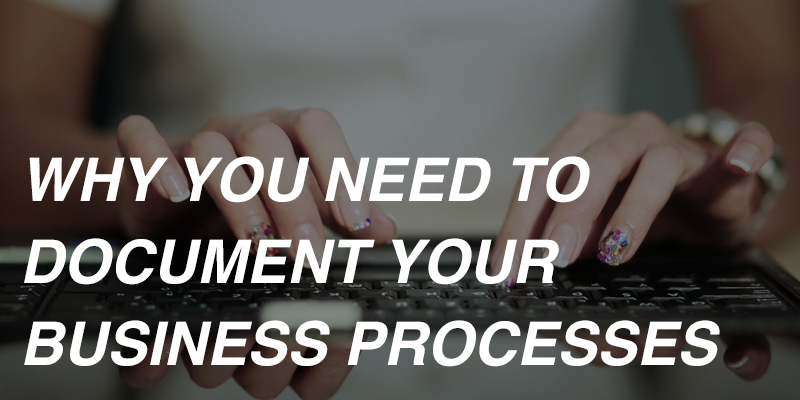 Once documented, you will be able to revisit your business processes over time, as technology develops and as the business grows, and continuously improve both the efficiency and quality of your service. Would you like a business that is systemized and runs without you? The first thing to do is make the commitment to build your business into something amazing. Systemising a business the right way does take time, the end results are, however, “Life changing” for you and your business. Need some help to get your systems out of your head and fast track the systemization process? Contact Wendy from Organising Works to book in a complimentary 60-minute strategy session. Wendy Tadokoro helps businesses and entrepreneurs to implement high impact strategies, systems and tools to supercharge their personal and business productivity. To find out more visit www.organisingworks.com.au or email [email protected].